Marriage proposals run from the prosaic and awkward – Who could forget Sylvester Stallone’s dopey proposal to Talia Shire in Rocky II — “I was wondering if you wouldn’t mind marrying me very much” — to over the top: skywriting, underwater, the Jumbotron at a nationally televised sporting event. Somewhere between these two extremes is the classic dinner date: some wine, some nice conversation, romantic lighting and then after dessert – or maybe as the dessert – the big question is popped. If you live in the South Bay and your engagement was decided after a bottle of wine and a fine meal, chances are it was orchestrated by Bottle Inn general manager Silvio Petoletti. Since its opening in 1974 the Bottle Inn has been recognized as the “Most Romantic Restaurant” in just about every Best of the Bay poll. “We average at least a dozen marriage proposals a year,” said Petoletti, who has been with the restaurant since its opening. “And with a noticeable spike around Valentines Day,” he added. People generally request table 12 at the front of the restaurant, or the corner table at the very back, next to the expansive wine cellar, he said. If romance were an entrée, a hidden gem in the dessert would be part of the standard fare. 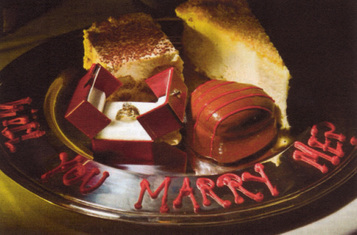 Whether mining for a brilliant round or a marquise cut in a crème brulee or triple torte, engagement rings discreetly buried into sinful sweets is a practice many a romantic eatery has seen — and occasionally with dubious, or even dangerous results. In addition to a gooey, sticky ring, choking, chipped teeth and other mood saboteurs are the risk one runs when taking even the most stringent of precautions with such a culinary surprise. The dessert tray is another tried and true method. The ring is discreetly positioned in the center of the tray, or on its own silver plate, occasionally with the words “Will you marry me?” written in a chocolate or raspberry drizzle. Some aspiring grooms take this role very seriously, and with Oscar worthy performances. He placed the ring box in the middle of the tray of desserts, steeled himself, and then stepped through the kitchen doors. It was show-time! Despite so many years in the restaurant business and it didn’t take Petoletti long to recall the most unusual of all of the proposals he has seen. The man brought his girlfriend in around Halloween and there was a pumpkin already sitting on the table with a lid cut into the top. At a certain point during the meal, he asked her to open the cap and see what was inside the pumpkin. Attached to the inside of the lid was a string. At the end of this string was her engagement ring. She said “Yes” as well. Petoletti, a native-born Italian, had never heard of this tradition. Numerous Google searches revealed nothing as well, although it was discovered that actress and singer Alyssa Milano had been proposed to similarly by one-time beau Scott Wolf. In an establishment as steeped in romance as The Bottle Inn, it’s tough to imagine finding yourself poised at the pinnacle of memorable proposals. Such was the case though for a couple that decided to tough it out against all odds and brave the elements of an unforgiving cold and windy day on the sands of Hermosa Beach…and all in the name of romance. The staff responded by escorting her out to the table that had been set up on the sand. The parents took one look at the cold, windy beach and decided to stay inside, leaving the young lovers to brave the elements on their own. They did, and somewhere between the sand-blasting gusts of wind, the man proposed, and his girlfriend said yes. Although not one of the more creative approaches, one proposal stands out in Petoletti’s mind as the most touching. Conventional wisdom holds that every battle-plan is perfect — until the first bullet is fired. Equally passionate exercises, love and war are diametrically yet explicitly bound, and with results that are oftentimes just as ironic. Expert archer William Tell may have hit the apple perfectly with his arrow and in the process saved his son’s life, but occasionally Cupid misses…and usually with comical results. The most spectacular of the romance-gone-south incidents at the Bottle Inn, occurred during one of the dozen or so “waiter-with-the-engagement ring/dessert-tray” imposter attempts. “Not being experienced with the restaurant, the aspiring groom-to-be accidentally went out the in door of the kitchen and collided with another server entering the kitchen,” Petoletti remembered. Faster than you could say ‘Will you?’ he found himself wearing the dessert tray all over his chest. Luckily, one of the waiters, who lived next door to the restaurant, went home and grabbed a clean shirt for him. He changed, picked up a new tray of desserts – including the engagement ring – and went out to present it himself. Disaster was averted, and the woman accepted. Not unlike a bank heist or military exercise, successfully executed surprise proposals require the use of additional resources with well-honed expertise. The Bottle Inn certainly qualifies in this category and has an expert staff that is capable, willing and eager to help as well. A sense of pride also pervades the restaurant as employees realize that theirs is “The Spot” where more South Bay couples prefer to pop the question than at any other place. When asked what advice he would give to suitors wishing to ask the big question, he has some simple yet sage advice.